Okay, I have finally finished my translation of Higurashi no Naku Koro ni Hou. Yippee! Now I can move onto something new! Probably the two untranslated Rei arcs or a (or some) Matsuri/Kizuna exclusive arc, I'll decide that soon enough. Anyway, like last time, I have prepared two versions. One with a few untranslated JP words (Onee, Oji-san, nakama etc) here and there, and another version that has those specific words translated into English, which I call the English variation patch for some reason. I'm not very good with names. If you want to see the full list of the untranslated JP words, you can check out the document below. That said, I'm very satisfied with the overall outcome. I have put a ton of effort and work into it and I hope it shows. It went through many proofreads and fixing up, some of which was done by a helper or two. Although I still had to implement said fixing up, just saying. Anyhow, I will drop the credits for those people at the bottom. Also, even if you yourself spot any errors, please inform me so I can implement changes and fix it up. I'm not perfect, so I may have missed some things. Now, what everyone is waiting for, if anyone bothered to even read what I just wrote that is. The download, you will find both versions up for download below. So, go get that and get reading. Hou was recently released after all, and I really want to know what people think of its story. Personally, I found Outbreak to be the most interesting, followed by Hinamizawa Bus stop and then Kamikanshi-hen. It was very entertaining and the music was great, its also significantly better than its anime adaptation, Bus Stop was new (to me) and was thus interesting, the characters were different and so was the story, while Kamikanshi-hen wasn't quite what I expected. Its just not the proper sendoff or "Gift" I expected for Higurashi's deathbed. 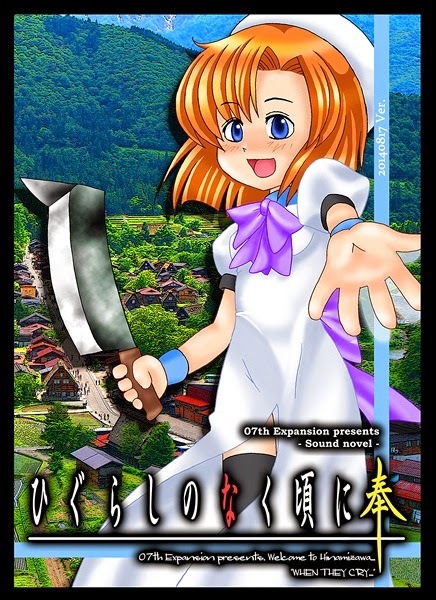 I know more Higurashi is coming out, but not from Ryukishi07. He washed his hands long ago and has since then moved on, sad yes, but that's reality, or at least I hope not. Anyway, I'll stop myself before I run my mouth, you'll find the downloads below. Have fun! Spanish translators "23rd District" contacted me shortly after my previous released and asked if they translate my translation into Spanish. Naturally, I said yes, so it seems the Spanish community will also get Hou some time in the future. Yay! Where do I get Higurashi Hou and how do I install the patch? An offical Higurashi Hou English translation will be released by Mangagamer.com on both their Website and on Steam in separate chapters and with remastered sprites, the first of which will be released on the 15th of May for 4.99 USD. I can't wait! Yeah, I heard about it. However, their release will probably be years off seeing how long it has taken them to do the first arc and also the fact that Hou will be at the end of things. But i have to ask, is there anyway that you know of to get the save menu from hou into the other three higurashi games? the ones bundled with the first disk have it but i could only get my hands on the second disk. Also do you have any current plans to translate Higurashi or kai? its been so long since the last update by when they translate, like 2013 is when they posted that they were like 80% done with the second chapter lol. Well, the save menu and the like are essentially image files being displayed and what not, but to answer your question, it would involve knowledge of the code that the game uses. Anyhow, about regular Higurashi and Kai, I don't have any plans to translate them since they already have been, and the fact that I don't want to spend months (or more for a single arc) working on something because of that, when I could work on something new. Thank you for this patch! Seriously, you are awesome!